The Royal Canadian Air Cadets is a national organization for Canadian youth between the ages of 12 and 19. This organization is made possible through a partnership between the Department of National Defence and the Canadian Forces and the Air Cadet League of Canada. Participation in the Air Cadets can be quite the experience. The Squadron meets for regular training on a weekday evening through the school year. Optional training, including band, sports, marksmanship and other activities are held at other locations, mainly on weekends. In July and August many regional and national summer training courses are available to the cadets. The summer training courses provide valuable training at no cost to the cadet. Cadets actually get PAID for attending! 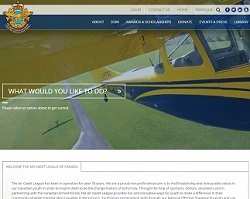 All Squadrons in Canada are listed on the Air Cadet League of Canada website. Squadrons can be found by Province, City and Squadron Number. Use the map below or the list of Squadrons to locate Squadrons that have a website hosted here at www.aircadets.ca. Current Cadets and their families can get the latest announcements and resources that they need. Your future recruits can see what 'stuff Cadets do' and where to find you! Alumni can keep up with their Squadron. A no-tech solution - your Squadron Staff and Sponsoring Committee does not need technical skills to design and maintain the site. Let us do the work for you! Easy to remember domain - your Squadron website will be www.aircadets.ca/your Squadron number. NO complicated domain name to relay. Frequent updates - National information will be updated for you when it is released. Updates to your Squadron information can be submitted weekly. Conforms to the regs - our websites are designed to be in accordance with CATO 11-06. Professionally designed template - the www.aircadets.ca websites meet current web design standard practices. The template is specifically made for ease of loading - to accommodate viewing on a low-speed internet connection and wireless devices. Recognize local sponsorship - you can provide a logo and link for a local sponsor that can be put on all of your Squadron's webpages. We WILL NOT advertise on your Squadron website - some hosting companies will sell advertising to display on your page. That WILL NOT happen on your www.aircadets.ca website. Construction of a Squadron website based on our template and hosting of it on the www.aircadets.ca servers. Automatic updates to National content. You may submit weekly updates to any and all of your Squadron content. Anytime access to an easy to use Google Calendar that you will be able to maintain. The Squadron Sponsoring Committee Chairperson or Squadron Commanding Officer are encouraged to use the form below to contact the www.aircadets.ca staff to get more information on hosting your Squadron's website. NOTE: Responses will be sent to the email address provided along with copy to the Squadron CO Cadet Net account. This website is owned and operated by DBL Computing. Squadron websites hosted here are done so on behalf of the Squadron's Sponsoring Committee. The intent of these unofficial websites is to keep our Cadets and their families informed of Squadron activities and events on a regular basis.